A World Record attempt for the most people at one time learning simple, life saving first aid skills has been a resounding success. 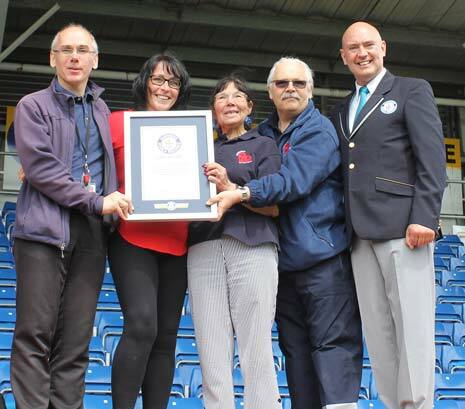 1,795 school children and local residents took part in a World Record attempt and undertook a first aid lesson at the Proact Stadium in Chesterfield, at the same time (above). The previous World Record was held by Emirates Transport in Abu Dhabi on 27th April 2013 and saw 1700 participants take part. 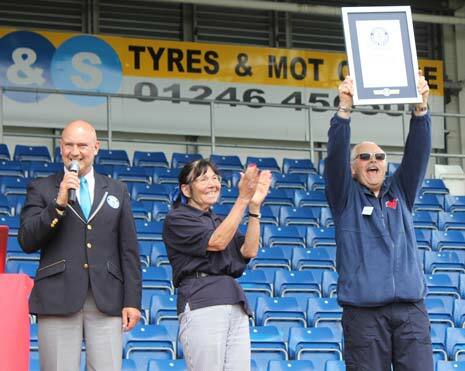 The World Record attempt was organised by the Community Save a Life Scheme, in partnership with Bolsover District Council. Chesterfield FC, British Heart Foundation, Rotary International and Inner Wheel supported the event. 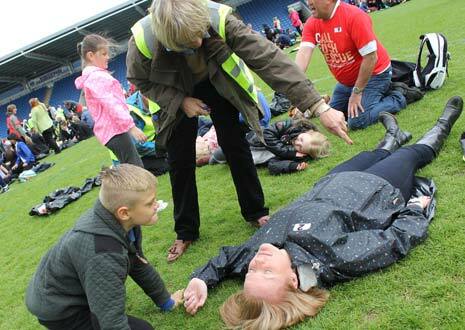 The event took place on the pitch at the Proact Stadium on 20th May 2016 and the aim of the event was to give people the skills and confidence to deal with everyday first aid occurrences such as fainting, choking, serious bleeding, a heart attack and cardiac arrest. Bolsover District Council Leader, Councillor Ann Syrett (left), said, "I'm delighted the attempt was a success and I hope it gives local people a boost in confidence if they ever find themselves in a first aid situation. Well done to everyone who took part and supported this event." Dr Cheryle Berry, from the Community Save a Life Scheme, said: "This is the first time this has been attempted on such a large scale and I am absolutely thrilled with the response from the local schools, I'm so proud of them all. "Today has been a dream come true and it's such a boost for the Scheme, I would Iove to see it put on the National Curriculum. 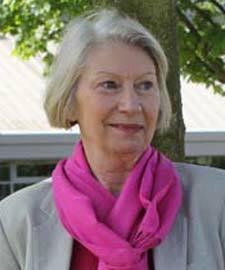 "I would also like to thank Bolsover District Council for their community leadership, which has been second to none." Glenn Pollard, Guinness World Records Adjudicator said: "This has been one of best organised events I have ever adjudicated. "The success of this attempt is testament to everyone involved." Hundreds of people lined the route as the Flying Scotsman passed through Chesterfield over the weekend. Stagecoach Yorkshire will be joining hundreds of venues and companies across the UK to support Disabled Access Day on Saturday 12th March. A teenager from Chesterfield has been selected from thousands of young people across the country to be one of the faces of a national advertising campaign. Actress, singer and fitness guru Kym Marsh visited the newly opened Queen's Park Sports Centre on Saturday, and spoke to many users of the facilities on Boythorpe Road. A new state of the art elderly and dementia care home has opened its doors in Dronfield thanks to funding support from Royal Bank of Scotland. Derbyshire Wildlife Trust's badger vaccination programme is to feature on ITV’s Countrywise with Ben Fogle next week. ARNOLD CLARK IS NOW RECRUITING! The stage was set for the festive season in Chesterfield yesterday as thousands packed into New Square to celebrate the switching on of the Christmas lights by stars of this year's panto and local dignitaries (oh, and Santa himself!). The Mayor and Mayoress of Chesterfield attended the opening of the salon of a Global hairdressing icon - and local lad - who has now opened a salon in the town, bringing not only his famous brand, but several jobs. Chesterfield's latest landmark, 'Growth', the sculpture at Hornsbridge Island, has been officially launched. On the 11th hour, of the 11th day of the 11th month, Chesterfield, as it always does, fell silent to honour and remember those who have fallen in conflicts recent and past. An award-winning designer was at a Chesterfield jewellery store on Saturday - showcasing his range of statement pieces and unveiling his Cannele twist engagement ring. The 9/12th Lancers, marched through Chesterfield this morning as part of their homecoming parade after returning from an eight month tour of duty in Afghanistan.